Tech basketball is becoming quite the hotbed for transfer talent. After picking up the sensational transfer from Texas, James Banks III, earlier this year, Josh Pastner landed another impact transfer this month in the form of Jordan Usher, a 6’ 3” forward from USC. Pastner has recruited like a madman thus far, bringing in four-star talent in the form of ESPN Top 100 recruit Michael Devoe in addition to Kristian Sjolund and Khalid Moore, but in terms of players who can immediately make an impact, Banks has arguably been Pastner’s most significant acquisition this year and Usher may yet provide similar immediate impact after becoming eligible. It is hard to overstate the impact Banks has provided this season. After spending two seasons on the bench at Texas, showing off solid efficiency in limited time, Banks transferred to Tech and was granted a hardship waiver by the NCAA, allowing him to play immediately. The waiver processed literal hours before Tech’s second game of the season against No. 5 Tennessee, and after rushing to the game, Banks picked up five points and seven boards off the bench, kicking off a breakout season for the 6’9” forward. Banks has been instrumental in Tech’s frontcourt, anchoring Tech’s stellar defense and providing an intimidating rim presence. While an excellent scorer in the paint, Banks has shined at the other end of the floor, ranking No. 2 in the ACC in offensive rebound percentage and No. 1 in block percentage and defensive box plus/minus. By Player Efficiency Rating, Banks has been Tech’s best starting player, and Banks ranks just second behind Evan Cole in effective field goal percentage. Under Banks, Tech’s defense has evolved into a force to be reckoned with — the Jackets rate as the No. 10 team in the country defensively according to KenPom.com, behind only Virginia and Duke in the ACC. Jordan Usher promises a similar impact. Having been similarly relegated to bench duty on a strong USC team, the former four-star recruit has averaged 14.3 points and 6.1 rebounds per 40 minutes in limited time at USC this season. Usher has displayed excellent sharpshooting skills while at USC — the forward has shot 37 percent from beyond the arc in his collegiate career and 73 percent from the free throw line. Turnovers have been an issue for Usher this year — he has just a 1:1 assist to turnover ratio — but he still promises to provide an extra offensive boost for a team that needs more scoring threats. Usher and Banks are impact players, to be sure, but why Tech? For both players, the answer hits close to home, quite literally. Banks was born in Decatur, and Usher was a standout at Wheeler High in Marietta, leading his high school team to the state GHSA 7-A semifinals. Both players were former top prospects from the state; according to ESPN, Banks was the fourth best recruit from Georgia and ranked No. 57 nationally in the class of 2016, and Usher was the No. 12 recruit in the state for the class of 2017. Both players found themselves locked out from significant playing time at their previous schools. Returning to their home state and going to college in Atlanta at a program where they can be offered serious minutes yields benefits to both Tech and the players. 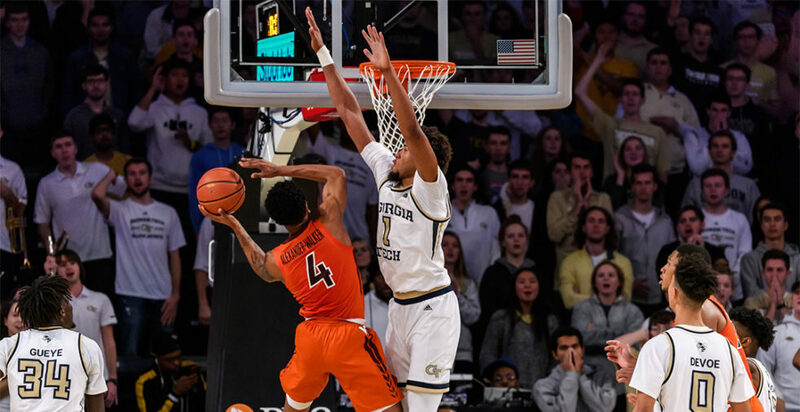 Banks has blossomed into one of the best defensive players in the country while anchoring one of the best defenses in the country, and Usher can similarly develop at the other end of the floor and provide the Jackets with another deep ball threat. Pastner’s success with Josh Okogie and Ben Lammers in his first two seasons accelerated the clock of his rebuild significantly — Tech’s surprising success in Pastner’s first two seasons thanks in no small part to these impact players proved a significant demand among students and alumni for good basketball at Tech, and Pastner has some pressure to provide a little faster than expected. Bringing in top tier transfer talent gives Pastner an immediate impact for the team — after all, Tech’s success in the ACC thus far is in no small part thanks to Banks’ emergence as one of the best players on the team — while allowing him the time to further develop his own raw recruits out of high school, players like Devoe and Sjolund who display promise but require further refinement. Players like Banks and Usher provide Tech with the opportunity to win now and win later — a victory for Pastner’s program, both in the short run and in ensuring that he will have seasoned players as the years go on.